Holiday Art Party at Domsky Glass! Join us on Dec. 1st from 2pm-8pm for our Holiday Open House Art Party where you become the artist! Come make your own custom blown glass ornament (with the help of our professionals!) and paint your own canvas (a great gift of your own personal treasure!) with artist KD Matheson! 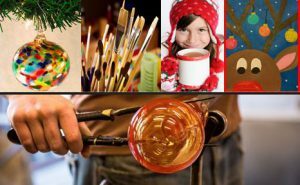 Or sip hot coco while enjoying the entertainment of our live glass blowing demonstrations. Admission is free and $30 per art piece you create. All blown glass items will be ready the following day for your pick-up! between 12-2pm!